They say sometimes when you miss someone special, the whole world seems to be empty and life comes to a standstill. 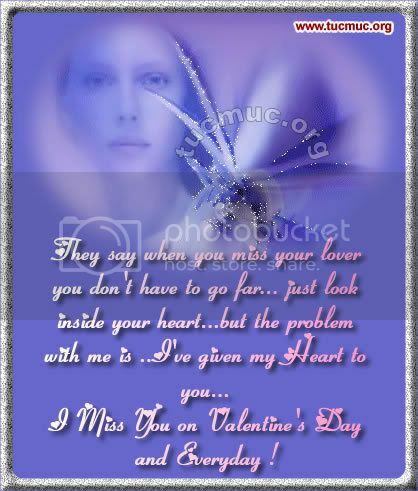 How sad does it feel when the person you love the most is away from you on Valentine Day. OUr graphics will help you to let him/ her know that how badly your missing them. It is because of you, my angel, that I now understand all of those quotes about love. When I wake up and see you lying next me, I can't help but smile. It will be a good day simply because I started it with you. In this crazy world, full of change and chaos, there is one thing of which I am certain, one thing which does not change: my love for you.